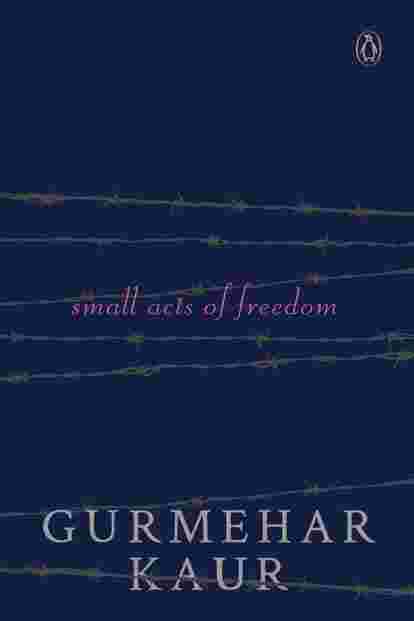 I always knew that this was a book I was going to write," says Gurmehar Kaur about her memoir, Small Acts Of Freedom. “I had been constructing it exactly like this in my mind since I was 12." Gurmehar’s first book is the story of three generations of women—her nani (maternal grandmother), Amarjeet, her mother, Raji, and Gurmehar herself. All of them have dealt with loss and death when they were least prepared for it. All of them have transcended it and emerged stronger. “My mother argued with me a lot when I was writing," says Gurmehar. “Why are you writing about us, why don’t you write your own story, about your friends, tennis and college life, she would ask. I told her that your story is my story." “Is it a good book?" she asks me with laughter in her voice when I tell her I have read a preview copy. “You know, even my mother hasn’t read it yet." “It made me cry," I tell her. “Many times over." I don’t remember when an author has shown me the world from a traumatized child’s point of view with such stunning clarity. Gurmehar the author has access to the world of Gulgul, her own three-year-old self, as she had struggled to grasp the permanence of her father’s death in 1999 during the Kargil war in Kashmir. How could he not keep his promise to return? Surely the child will find him if she sneaks back to the home they had lived in together. He will return if her grandmother continues to cook his favourite breakfast. She remains convinced for a long time that there is something she can do to bring him back, even searching behind wreaths because she had last seen his body lying in a coffin behind a large wreath. But, no, all she finds are blank walls. No Papa waiting for her. “How difficult was it to write this book?" I ask her. “I made a lot of 3am calls to my editor. This is too hard, I would say. I knew I always wanted to write this book but I never realized how exhausting it would be in terms of the series of emotions I went through while writing it. Writing meant reliving every moment that one would rather forget. “I also wrote most of the book while I was in my third semester, so it meant I had classes to attend till 5pm everyday. I would come back in the evening, finish with some college work and then get down to writing between 10pm and 4am. I would be in college again at 8am the next morning. I lived this rhythm for months. “I think the first time I slept properly is when my editor told me the book has gone to print." In 2017, Gurmehar was featured as a Free-Speech Warrior in Time magazine’s list of Next Generation Leaders. She was one of the few who were chosen to attend Barack Obama’s Town Hall in New Delhi. As a speaker at TED Talks India: Nayi Soch, she spoke about the power and the risk of raising your voice. “It’s not just about what happens to you," she says. “It’s also about how you react to adversity. I could have backed off and apologized. Or become silent. But it would have been an insult to my family, to the way we have lived all our lives. My own life has been a journey from a place of hate to a place of love and forgiveness. I want everyone to see that. If I can overcome my loss, so can others. “I don’t have many memories of my father but I have some very vivid recollections that have shaped me as a human today. I grew up wanting to be like him because everyone kept repeating to me that I was a brave daughter of a brave soldier. The idea of courage has changed for me over time. As a child I thought being violent and hurting people was being brave. But then I learnt a new kind of definition, the one that I associate with my mother and nani. The guts and determination to create the life they have—for themselves, my sister and me." To recover from the onslaught of online hate, threats, labels and intrusive media attention, Gurmehar went for a Vipassana retreat for 10 days last year. She returned with a renewed calm and wrote a post on her own blog. “I’m an idealist. An athlete. A peacenik. I’m not your angry, vindictive war mongering bechari you hoped me to be. I don’t want war because I know its price; it’s very expensive. Trust me I know better because I’ve paid it everyday. Still do." “Writing was one tool I had," shares Gurmehar. “I used the only weapon I wanted to. I was not going to have anyone else tell my story. I will control my own narrative. I am very stubborn that way. You can say arrogant also. I just feel that I know better." “You have become a symbol of hope and healing, not only for your own generation but also for people older than you. Does it sit heavy on you?" I ask her. “I try not to think about it," says Gurmehar. “The day I sit down to ponder and think about everything that people see me as, good or bad, I will go crazy. I only focus on things that are in my control, and other people’s thoughts aren’t. “This is my life. I have thought about it very deeply," she says. “I also have a sense of freedom now. The story has gone. I have handed it over to readers." Small Acts Of Freedom, published by Penguin Random House, releases on 16 January.